I am unable to connect remote desktop on Remote-PC and also cannot connect to that PC teamviewer unless that desktop is once logged in by a remote user! After power failure system reboots to login screen. But network initialization is always taking place after getting logged on in Windows 8.1 Os. Is there a possibility it can initialize network as it boots up? I didn't find any problem with other Windows Os versions. Maybe you need to install the last updates. If all this fails, manually replace the rdpcorekmts.dll file with the correct version (6.1.7601.17767 for 2008 R2 SP1). Add TeamViewer program as a basic task in Task Scheduler. Task Scheduler can make a computer run a program even if the computer is locked by a password during startup. Just keep your account signed in always in TeamViewer then it will automatically run TeamViewer at startup even if your computer is locked by a password. 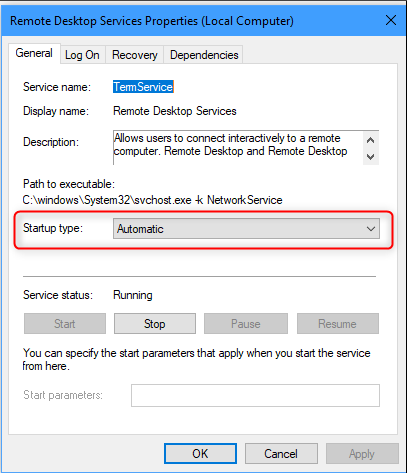 You can download programs or apps like Shutdown Start Remote app that remotely startup or shutdown computers or even wake it up from sleep mode. From that way, you can enjoy yourself controlling your computer without even sitting in front of it again. Just make sure the computer is always plugged in to the outlet that supplies it electricity as there is no way to remotely switch the electricity on or off. I'm even using it right now in my own tablet. Hope that I've been a helped to you or maybe you have already figured this out. If that's the case, please don't reply any negative comments on my answer 'cause I'm a very optimistic person and I hate turning people down. Only positive comments are accepted and will be read. Thank you! I had this same issue in Windows 10 - somehow Remote Desktop Services was set to startup manually. Just go into services - restart it and set to Automatic.